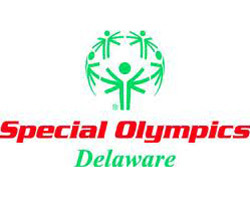 The 2012 Special Olympics Delaware Summer Games concluded yesterday [June 9] with the Bermuda team winning 35 medals. Bermuda was represented by students from the Cedarbridge Academy Functional Skills Class, with all the students doing extremely well. CedarBridge Academy Functional Skills teachers Ralda Jones and Alicia Zuill, as well as P.E. Instructor Mr. Watts, accompanied the team. The Cedarbridge team claimed a total of 35 medals – 23 Gold, 5 Silver and 7 Bronze Medals, and also claimed 3 fourth place ribbons. The Cedarbridge Academy 4x100m relay team — Shakino Cann, Fabio Defrias, Justin Smith and Delton Woods — won the Gold Medal. Kacy Darrell won the Gold Medal in the 25m Walk and picked up the Bronze Medal in the 60m Walking race. Bridgette Marshall won a Gold Medal in both the 100m and 200m Final Division Five Walk, and also claimed a Silver Medal in the Softball Throw. Mahalia Maynard won the Gold Medal in 25m Dash and the 100m Final Division One Walk, and won a Bronze Medal in the 50m Dash. Justin Smith finished 5th in the 100m Dash, Smith won a Gold Medal in the 400m Walk, before finishing 4th in the 50m Dash. Christopher Talbot won the Gold Medal in the 100m Final Division Three Walk, and also won the Silver Medal in the 50m Walking race. Shaqune Whitehurst won a Gold Medal in the 25m Walk, a Gold Medal in the 100m Final Division Four Walk, and the Gold Medal in the 50m Walking race. Delton Woods claimed a Gold Medal in the Division Four Shot Putt, a Gold Medal in the 200m race, and then finished with a Bronze Medal in the 100m Dash. Shakino Cann won a Gold Medal in the Division 201 Softball Throw, Cann also won a Gold Medal in the 100m Final Division 101 Das. Fabio Defrias finished 4th in the 100m Division Three Walk, and also picked up a Gold Medal in the 25m Dash and then won the Bronze Medal in the 50m Dash. Kirk Dill won a Silver Medal in the 400m Walk and a Bronze Medal in the 100m Walk. He also finished 2nd winning a Silver Medal in the 200m Walking race. Del-Che Landy won two Gold Medals, claiming the top prizes in the 800m Run and the 400m Run, Landy also won the Bronze Medal in the 200m Run. The Games offer athletes with intellectual disabilities the chance to compete in six different sports: aquatics, bocce, powerlifting, softball, tennis and track & field. WOW!!! That is so good to hear. Well done to all on team Bermuda Well done!!! Well Done Guys !!!! This is excellent. Great Job Justin !!! Yahoo!!!! im a proud parent!!! n more so every so blessed to have these teachers in my son’s life!! well done you guys!! see u on th 16th!!! WELL DONE CHRIS!!! And well done to the entire Bermuda Special Olympics Team! See you guys when you reach back home!! Well done to all you guys! We are proud of you. KACY you did yourself proud, and your family!!!!!!!!!!!! Whoop Whoop! Thank you to Ms Zuill, Mrs Jones and Mr Watts! Well done you guys!!! Way to go Bridgette!!!! Congratulations to all the athletes and their teachers! Well done! Congratulations to all the competitors, the teachers and supporters behind the scenes. You have made Bermuda proud. Congrats to all those who participated! Sounds as though they performed so well they could probably outdo our government! This is an amazing story!! I hope bermuda comes to the airport and shows their love!! Never Doubted how amazing you would be, you are my hero Kemari and have made me a better person by having you as my child. They doubted you would ever be this great…. Look whose laugthing now, God had a purpose for you in this world. My Mr Amazing. Congratulations and well done to each and every one of you!!!! Bernews thank you for sharing. Congratulations to Shakino and the entire team. We are so proud of you. A big thankyou to Mrs. Jones, Ms.Zuill and Coach Watts for their tiredless care and compassion in helping the students to achieve their goals!!!! Congratulations to all sports achievers. Mandatory sports programs with tough love is what we need for prisoners – not being locked up where they learn more bad tricks ! Congrats to the whole team, but special shout outs to Kemari! YOU ARE THE GUY BABY!!! I dont know what that comment is above talking about people doubted you, maybe only she did! you are great and I am very proud of you!